A South Burlington woman this week ended her life by using the state law that allows terminally ill patients to hasten their own deaths by seeking a lethal dose of medication. Kimiko Yumoto, 60, the wife of Burlington Free Press reader engagement editor Aki Soga, died Tuesday, according to her obituary in the Free Press. After initially being diagnosed with Parkinson’s disease in 2007, Yumoto learned in 2011 that she had multiple system atrophy, her obituary says. That is a degenerative condition that diminishes the body’s involuntary functions, including heart rate and digestion. 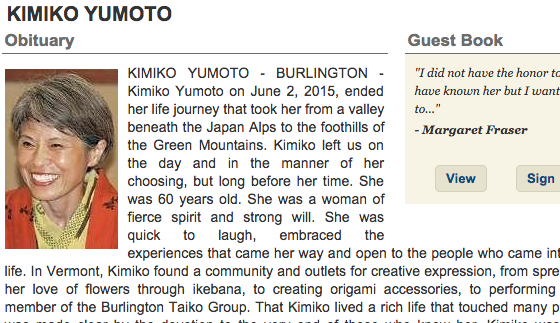 Yumoto, the mother of two sons, had been a member of the Burlington Taiko drummers' group, had her own business making origami accessories and taught Japanese, according to her obituary. According to the state Health Department, physicians have reported writing eight prescriptions under the law, the only information publicly available about how the law is being used. The state has no provision for tracking how many patients ingest the prescriptions. Seven Days has chronicled the stories of some of the first patients to use the law. The law, enacted in 2013, allows those diagnosed with less than six months to live to legally obtain a lethal dose of medication. Vermont is one of three states with such a law. Soga weighed in on the law in this Free Press editorial in February, in which he called for continuation of oversight measures such as the requirement that a patient get a second opinion. Gov. Peter Shumlin last month signed a bill that continues those measures, which had been set to expire. Disclosure: Terri Hallenbeck is a former Free Press reporter and was a colleague of Aki Soga.